An advanced malware removal and browser protection utility. IObit Malware Fighter Pro 5.0.2 was available as a giveaway on April 28, 2017! 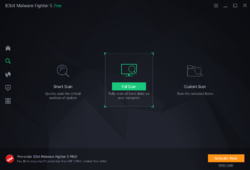 How would you improve IObit Malware Fighter Pro 5.0.2? How do you update to a newer version and maintain this 6-month trial of the PRO version ( v5,02-5.1.0 ). When I attempt to update to the offered new version through the IObit program, it, the download shows as a "trial setup". Of course, I would like to get the newest version without losing the GOTD 6-month trial. Went to Windows 10 Creator. Took 20 min to start. Stopped IOBit startups. Had to reinstall Windows 10 Creator. Because I lost all my programs I then went to a back up to which was the previous version of Windows 10 and, strangely, IOBit Drive Booster appeared surrounded by a black screen. Windows 10 did not boot. Rebooted and got into Windows 10. Removed all IOBit programs. The computer rebooted quickly and seemed to be more responsive. Startup has continued to be very fast. In hindsight, I should have tried booting into safe mode and removing IOBit programs - but I thought Windows 10 Creator was the problem. No more IOBit programs for me. I am now very wary of programs that want to take over the computer on startup. Went to Windows 10 Creator. Took 20 min to start. Stopped IOBit startups. Had to reinstall Windows 10 Creator. Because I lost all my programs I then went to a back up to which was the previous version of Windows 10 and, strangely, IOBit Drive Booster appeared surrounded by a black screen. Windows 10 did not boot. Rebooted and got into Windows 10. Removed all IOBit programs. The computer rebooted quickly and seemed to be more responsive. Startup has continued to be very fast. In hindsight, I should have tried booting into safe mode and removing IOBit programs - but I thought Windows 10 Creator was the problem. No more IOBit programs for me. I am now very wary of programs that want to take over the computer on startup. David, I have had customers that have been suckered into installing one piece of iobit software stable in an attempt to fix their windows problems only to be nagged/duped into installing almost all of the rest of iobits products... and ended up with a practically unusable PC because all iobit products together is not a good combination! As well as not solving the original problem! Remove all iobit products, then I fixed the original problem... Then everything works again as it should. 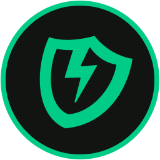 Before some say Iobit Malware is a mediocre Antivirus software, but hey it comes a long way, and it definitely worth checking out. Especial now it comes with the new Anti-Ransomware Engine, Camera Guard and Download Protection. Besides, I believe it scans HDD much faster than Norton or Macafee. jugem, if you re-read the description you'll find it's not even iobits antivirus software it's Bitdefenders! iobit add that to their malware fighter engine. GUI is very cluttered, doesn't give any real info what malware it is supposed to have found and nags you about other Iobit products and frequently tries to install Advanced System Care on the fly. I'll stick with Malwarebytes it's just about the best there is. I'll pass thanks. MPC Cleaner and the other 2. It had taken over my browser. I currently have a Laptop problem and can only work in Safe Mode. I also have MalwareBytes and it did not remove MPC etc.Reason?...it does not work in Safe Mode. Iobits got rid of some other stuff as well. I was hoping it would get me back to normal booting..but my problem is a bit deeper than that I suspect. I did d/l this s/w and all went well. It got rid of that hard to get rid of... MPC Cleaner and the other 2. It had taken over my browser. I currently have a Laptop problem and can only work in Safe Mode. I also have MalwareBytes and it did not remove MPC etc.Reason?...it does not work in Safe Mode. Iobits got rid of some other stuff as well. I was hoping it would get me back to normal booting..but my problem is a bit deeper than that I suspect. Seems like a fair deal - basically, a 6-month free trial to see if it's worth buying. 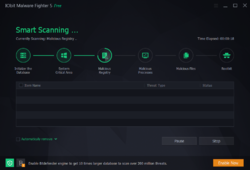 We won't use this at home simply because we already have Avast free edition and MalwareBytes as a backup to that for on-demand scanning/removal. Seems like a fair deal - basically, a 6-month free trial to see if it's worth buying. 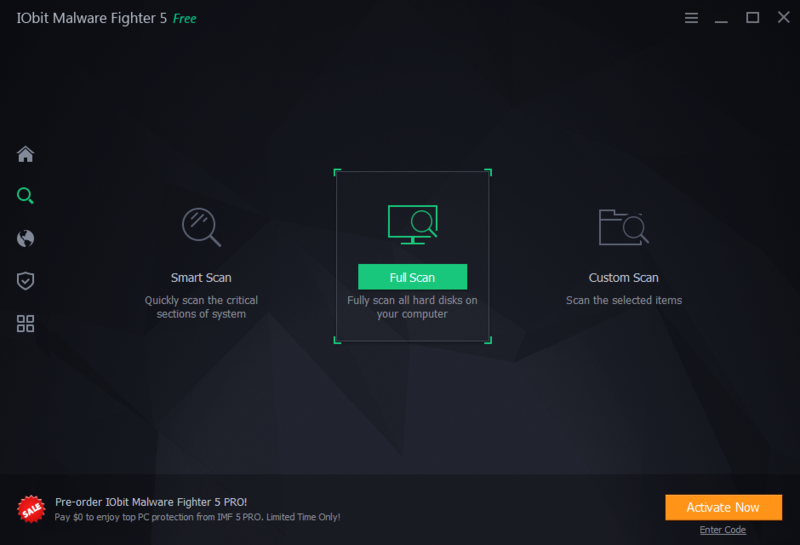 We won't use this at home simply because we already have Avast free edition and MalwareBytes as a backup to that for on-demand scanning/removal. while the other bundle "Valuable New Launch Pack"
It's not deceptive marketing just too many different offers on a single page generating information overload. Jim, $19.95 down from $39.95 is for 1 year on 1 PC the $23.95 down from $54.95 base price is for the family protection pack 1 year on 3 PCs while the other bundle "Valuable New Launch Pack" IObit Malware Fighter 5 PRO $54.95 (family protection pack) Protected Folder $19.95 AMC Security PRO $19.99 only $25.99 instead of $94.89 It's not deceptive marketing just too many different offers on a single page generating information overload. Free? I'm in. If you like it, it can probably be purchased down the road(wait for a special) on sale for $10 or so, for a year. Easy installation and registration, opens up to an interface that I found totally unreadable, in fact the worst I have ever seen. Ran the default scan and it found 62 problems; my installed antivirus, Panda cloud, found one and another antivirus found two. Unfortunately, it gave no in-depth information for the supposed problems, I have had overly enthusiastic antivirus programs in the past and found them more of a hindrance than a help. Easy installation and registration, opens up to an interface that I found totally unreadable, in fact the worst I have ever seen. Ran the default scan and it found 62 problems; my installed antivirus, Panda cloud, found one and another antivirus found two. Unfortunately, it gave no in-depth information for the supposed problems, I have had overly enthusiastic antivirus programs in the past and found them more of a hindrance than a help. Uninstalled. SuperAntiSpyware with 20$ for lifteme licence is totally winner in theese kind of software. 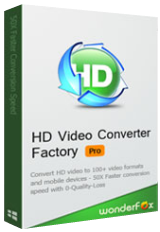 Cindy, use the free version and then they will offer the pro version for life for $19.95. Damir, yes, Superantispyware is correct software. Really for a lifetime? That's super good deal. rodken, Really for a lifetime? That's super good deal. Installed on Windows 7 Home Pro. When registering I got this message, " Cannot connect to our server, please check your network / proxy settings and try to validate your license later." bane, the license key is in the readme. I gave up on IObit software for the most part. Too many nagging screens to buy more of their products, or upgrade. I'll stick with Malwarebytes for my $40 a year. A tried and true product. Thanx anyway GOTD. HellsBells, --> I agree with you that IObit nags you nearly to death. That's why I don't use their software anymore either. There's too many choices out there than to have one company to behave in such an unprofessional manner. I may use their old Toolbox software but that seems to never contact the internet. HellsBells, yes, Iobit not too correct company. Jim, No matter how good iObit makes their software look on surface, their back story is one of constant nagware trying to get you to purchase yet something else from them. I've tried many of their software pieces and all of them have disappeared from my systems for that simple reason. However: iObit seems currently to have reduced its price to $19.95 a year if purchasing from its website. Depending on what one thinks of iObit, that web price may be attractive -- though why it needs to include a 'Windows Tweaks Guide' ebook as a make-weight is mystifying. 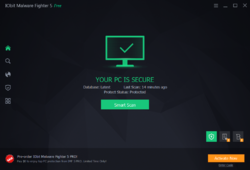 Just by way of clarification: this latest offering from iObit, as well as Malwarebytes' recently, and comprehensively, revised product, are rentalware due to the nature of this type of software. iObit charges $39.95 a year recurring, Malwarebytes $39.99 a year recurring (or $60 upfront for 2 years.) However: iObit seems currently to have reduced its price to $19.95 a year if purchasing from its website. Depending on what one thinks of iObit, that web price may be attractive -- though why it needs to include a 'Windows Tweaks Guide' ebook as a make-weight is mystifying. 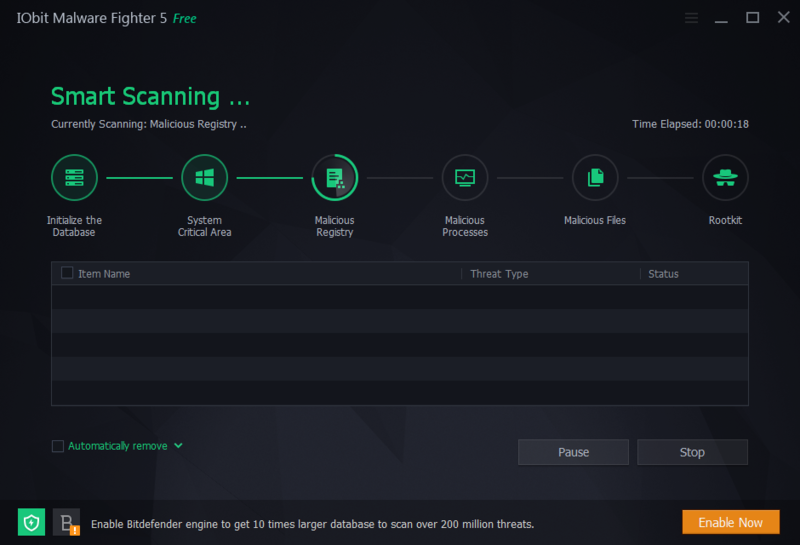 Iobit Malware Fighter is one of the best pieces of software I have worked with, it is easy to use and seems to do the job very well. I can would give it a 5 star. Downloaded, installed and registered with no problems on my windows 10 64 bit laptop. I'm a fan of IObit products but you have to watch their updates because they will quietly download some of their other products whether you want them or not. Thanks to the Giveaway of the day team and to IObit for todays giveaway and for keeping their products free or affordable for us to use everyday. And last but not least, thanks to our fellow members who not only ride these products hard but then take their time to tell the rest of us, the good, the bad and oh yeah..... the ugly. May you all live to be 100 and may the last voice you hear... be mine. Downloaded, installed and registered with no problems on my windows 10 64 bit laptop. I'm a fan of IObit products but you have to watch their updates because they will quietly download some of their other products whether you want them or not. Thanks to the Giveaway of the day team and to IObit for todays giveaway and for keeping their products free or affordable for us to use everyday. And last but not least, thanks to our fellow members who not only ride these products hard but then take their time to tell the rest of us, the good, the bad and oh yeah..... the ugly. May you all live to be 100 and may the last voice you hear... be mine.